Sakura Ryokan offers the most convenient access to all the major tourist attractions in Tokyo and its suberbs -- Asakusa, Ueno, Akihabara, Tsukiji Fish Market, Ginza, Roppongi, Tokyo Disney Land and even Narita Airport. You'll find the old spirit of Japan in 'Shitamachi'- the traditional downtown. Sakura Ryokan provides its guests with family style service and rooms with the emphasis on cleanliness. 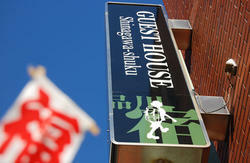 We are within an easy walking distance of Asakusa and Kappabashi street (several min walk) and Ueno Park. FREE INTERNET ACCESS Available on the first floor. 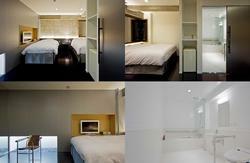 Both Japanese-style and en-suite Western-style rooms are available. We accept all the major credit cards and also have English speaking staff. Facilities include TV, air-conditioning, common bath, dining room, coin-operated laundry, vending machine, international telephone, copy machine, facsimile, parking(1,000 yen / space for max. 6) Breakfast (Japanese or Western): 840yen per person. Sakura Ryokan offers the most convenient access to all the major tourist attractions in Tokyo and its suberbs -- Asakusa, Ueno, Akihabara, Tsukiji Fish Market, Ginza, Roppongi, Tokyo Disney Land and Narita Airport. We suggest that you take the Keisei Skyliner train from the airport. Get off at the final stop, Ueno, and follow the signs to the subway in the direction of Kita-senju, and get off first at the stop, IRIYA. 6 minutes on foot along Kototoi street towards Asakusa from the No.1 or No.2 exit of Iriya station on the subway Hibiya line. Walk for about 80 meters to the left from the traffic light ahead of the Seven Eleven (convenience store). 15 minutes on foot from the JR Uguisudani station (south exit) or 5 minutes by taxi.